If you have an iPhone, iPad, iPod, or anything else that has access to the iOS App store; then you would know how confusing it can become. Each day you log in, it seems like there is always a massive amount of new apps to download, and because of that a lot of great apps get lost. Sometimes it can even be a chore just to find one single app, even if it is one released by a major company! Do you want to play that brand new "must have" game everyone is talking about? Well, you better know the name, or else you may just have a hard time finding it. Now this isn't always the case, but the point is that a LOT of great apps go completely unnoticed. This is what has happened to a little game called Pathika. Last weekend I was contacted by Sercan from the game developers "Devada." Earlier in the week Devada released their very first mobile game, and they were wondering if I could give it a try for myself, and see how I liked it. Well, here is what you might call my "mini review!" 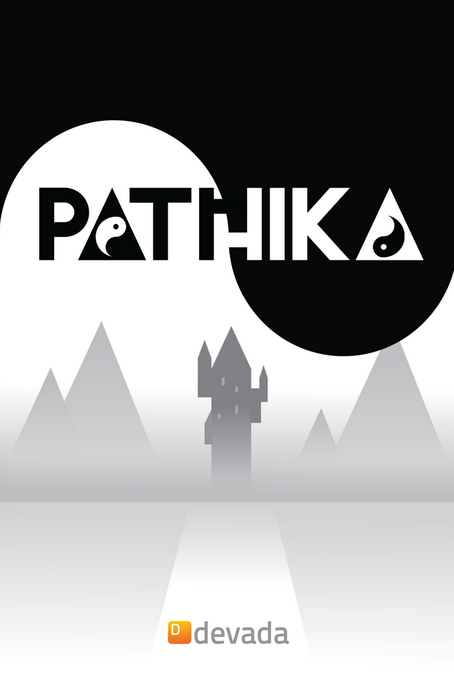 Pathika is an iOS puzzle game released by the Turkish developer Devada. The game follows two brothers by the names of Yin and Yang as they try to uncover an evil plot which is threatening their peaceful land made out of shapes. The game begins with Yin searching for his brother Yang, but as the game progresses, more of the "true" story is uncovered. Overall it is a simple little plot, and enough to push you forward, but it really isn't as important as the game's gameplay. As you play through the game, the main character(s) will have to go through dungeons, climb towers, and explore other areas of their world; however doing so isn't quite that simple. Each area, or level, of the game takes place on a shape filled screen where you must navigate your character to the exit. 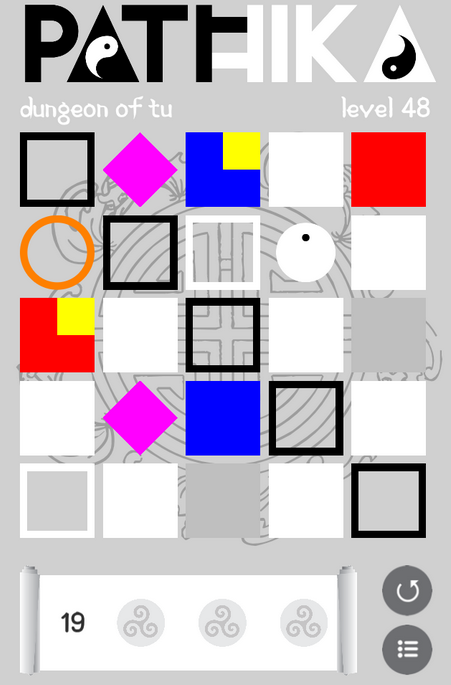 By tapping on the different squares and shapes on the screen, you can move your character to the next space; however, each space is not quite the same. 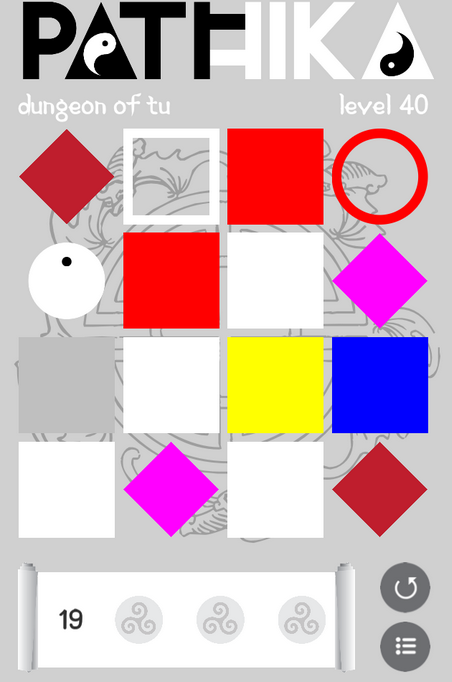 While basic white squares make up the pathway for you to walk across, there are also color coded squares, diamonds shaped objects, gray colored squares, and a few other types to get in your way. Upon stepping on a basic white square, the square will vanish, and your path will then be sealed off. Although the very same thing happens when you step on other shapes; the white squares are only there to vanish, and the other shapes are to solve puzzles. As you make your way through the game, more and more shapes will start to get in your way. 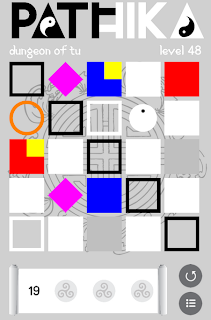 What starts out as a simple game with white path way squares, soon becomes one filled with walls, diamonds that warp you across the map, gray squares which take more than one step to destroy, and other obstacles as well. With each passing level, the game gets harder and harder, and the story goes deeper and deeper into the game's world. Although tutorials do pop up to help introduce new features; the game does not hold your hand when it comes to actually solving the puzzle for yourself. Although you can use "chi" to give you hints and help guide you to the exit, it is a limited resource, and it really can take the fun out of the game. If you are a fan of puzzle games, or puzzle games of this nature, then this is a game I would recommend checking out. The game is broken up into 5 episodes, each with 50 levels to play (for a grand total of 250 stages). While the first episode is completely free to play, the other 4 must be bought via an in game purchase. Each one is sold for a grand total of $1.99, but a 4 episode pack can be downloaded for $5.99 as well. With all things considered, Pathika really is a nice little game. It is a good time killer, it puts a new twist on an old puzzle solving standard, and it provides a good challenge! The game is also only around 20 MB, and it does in fact have achievements to unlock in the game center. Overall I give Pathika for iOS, a solid 8/10 (4/5 on the App Store)!